Wild: Beelzebufo Palucocus is the largest frog I’ve ever seen. Almost impossibly large, it can actually fit a full grown human adult on its back, though just barely. This is a dangerous prospect, though, as secretions from Beelzebufo’s skin and saliva have a narcotic effect on most creatures. Domesticated: Tamed Beelzebufo make for strange mounts. Strange mounts for strange people. Many tribes don’t believe there’s any reason to ride them. But some like the ability to take large vertical hops up huge walls and cliffs. Regardless of how it is ridden, Beelzebufo is also employed for its ability to quickly cull insects, and convert them into always-useful cementing paste. 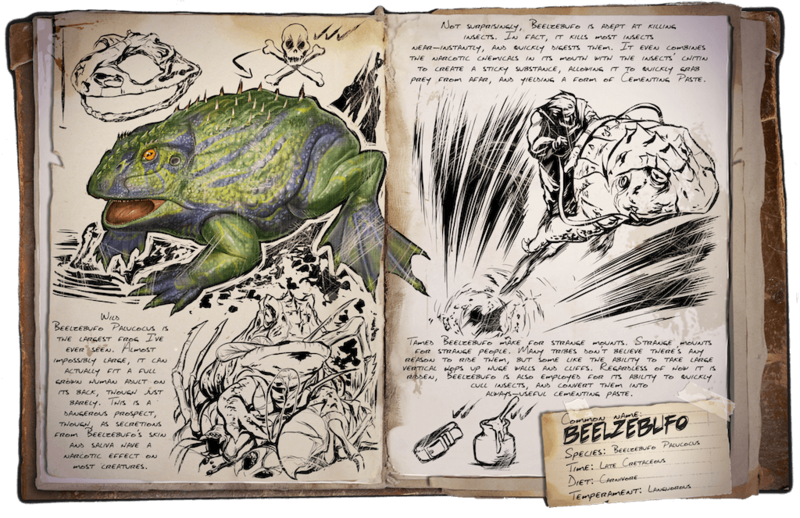 Known Information: Not surprisingly, Beelzebufo is adept at killing insects. In fact, it kills most insects near-instantly, and quickly digests them. It even combines the narcotic chemicals in its mouth with the insects’ chitin to create a sticky substance, allowing it to quickly grab prey from afar, and yielding a form of cementing paste.